It’s easy to get distracted while writing a book – usually by tangential subjects that suggest research, discovery and incorporation into the book at hand, until common sense prevails and the author realizes that, actually, this is all off-topic and should be left alone for another day. And maybe another book. The point of all this is only partially about the song’s mutation in its journey from Africa, though that itself is certainly interesting. (The music blog friday fish wrap has archived the versions by Linda Solomon’s Original Evening Birds, the Weavers, and the Tokens, along with one by Yma Sumac thrown into the bargain, so that you can hear that progression for yourself. This is probably breach of copyright, but given the following circumstances, one should not feel too guilty about downloading the files.) No, it’s more about the legal battles it inspired over authorship and therefore ownership – for “The Lion Sleeps Tonight,” a.k.a “Wimoweh” a.k.a. “Mbube” is probably worth at least $15,000,000 in composers’ royalty payments over the years. It occurred to me, when this song showed up in two different chapters of my book – one on folk, one on doo-wop, with both artists clearly concerned about the mess regarding its authorship – that there was a bigger story to be written. And indeed it has been. South African journalist Rian Milan set out to research the story of “The Lion Sleeps Tonight,” a.k.a “Wimoweh” a.k.a. “Mbube” several years ago. It makes for truly fascinating reading. Milan met with the family of original composer Linda Solomon, who died so poor he was buried without a grave stone; Milan was effectively (actually, very effectively) then stone-walled by virtually all the publishers, accountants, producers and songwriters who had subsequently profited from the song along the way. This “void” he parlayed into a feature for Rolling Stone, and in the spirit of the truly independent journalist, he must have held onto his own copyright, for the fascinating story, aptly titled “In The Jungle,” is available as an entirely free, downloadable PDF book courtesy of coldtype.net. “In The Jungle” is more than just a typed file. It’s properly laid out, with chapter headings and some illustrations. It’s also blessedly short – just 40 pages, maybe 10,000 words at most. Milan writes in a charmingly chatty style, describing publisher Larry Richmond as “an amiable bloke” and the Weavers’ repertoire as being “full of dreck.” It’s a style I personally love, though it is often frowned upon from above. 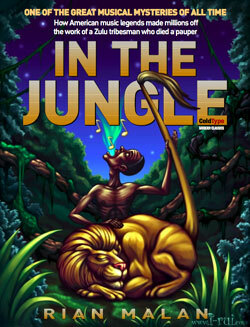 I’m pleased to see then that “In The Jungle” won a Da Capo Award for Best Music Writing and was a runner-up in American’s National Magazine Awards for 2001. (I must have missed it while writing a novel.) I’m even more pleased that Milan decided to share the piece with us in such a readable format. It’s a brisk read – I got through it in thirty minutes. But be warned: even if you already suspected that the music business was full of snakes, you will come away from this story feeling like you’ve been personally poisoned.